DESCRIPTION: High-quality, ready to use 100% RTV neutral cure silicone sealant with very fast curing and enhanced adhesive qualities. Suitable for low temperature sealing in construction. Particularly good with hard-to-stick plastics, PVC and copper. Neutral cure will not corrode copper metal roofing panels. Primerless, non-corrosive, and UV-stable. 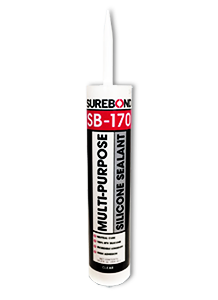 Replaces SB-1800 applications such as low temperature mounting of snow guards, sealing and general roof tile repair. For snow guards, mechanical fasteners must also be used with this product. APPLICATION: See Product Data Sheet. Very Quick Curing -- Tool immediately.